Back in October during a giveaway I asked all of you what kinds of tutorials you’re looking for. I got quite a few requests for Christmas patterns. I had just finished with all of the Halloween patterns, so I guess it’s about that time, huh? So without further ado, let me begin the Christmas tutorials with this little gem! 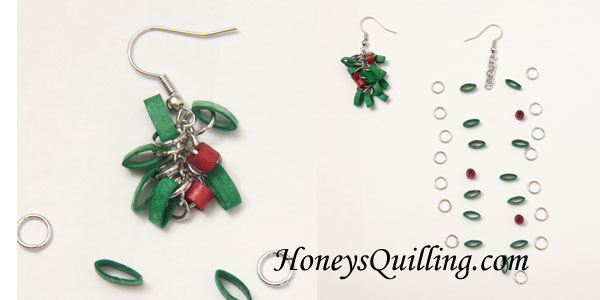 I first created these mistletoe earrings several years ago. 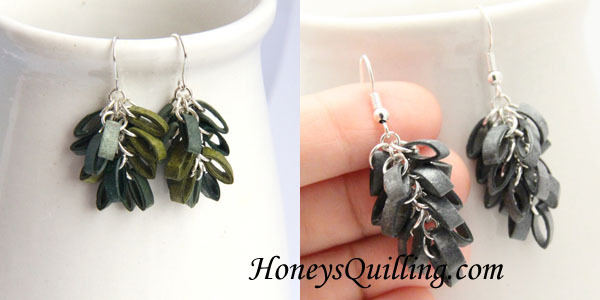 I had already designed a similar pair of earrings (in a different color and without the little berries) thanks to some suggestions from one of my sisters (she is an artist, you can see her work here). 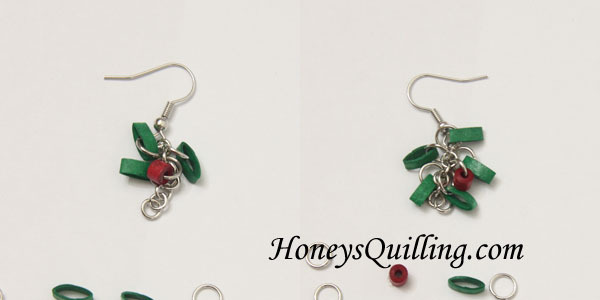 Afterwards I was creating some Christmas designs and I thought that with a couple modifications that they’d make perfect mistletoe earrings! I love this style of earring because it’s 3D, has a nice shake to it, and feels fancy. I used all 1/8″ (3mm) width paper for this project, but you can use any width you’d like. I wouldn’t suggest anything wider since you’d have to use bigger jump rings (unless you are going for a large earring look and you make your leaves a bigger size as well). But for a more delicate look you can use narrow (1/16″) width paper and use smaller jump rings. 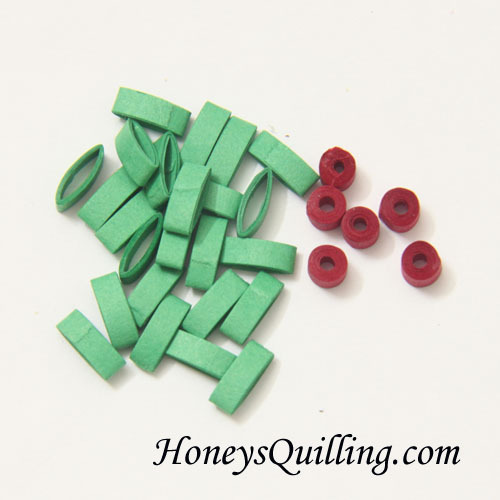 Roll each 3″ green strip around the end of the aluminum quilling tool, to create an open circle. 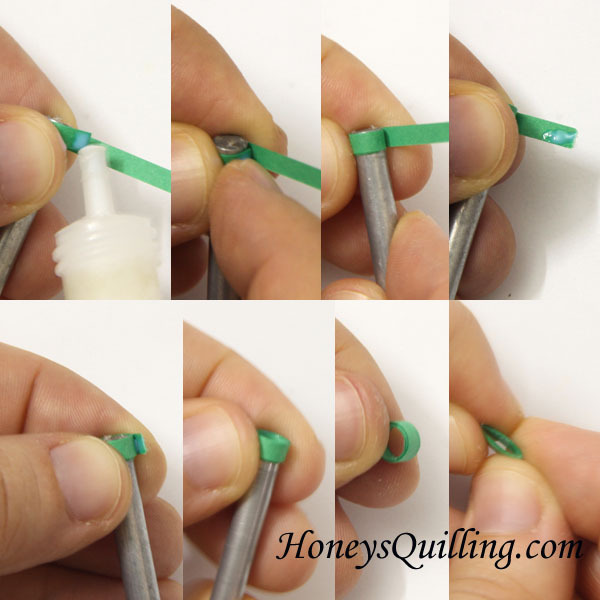 Glue closed and pinch into a teardrop shape. 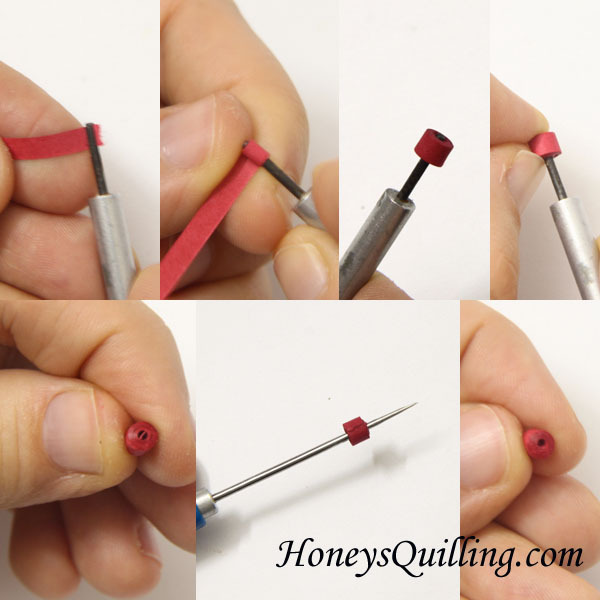 Roll each 3″ red strip as a tight roll on the slotted end of the quilling tool. Poke a needle tool or toothpick into the center to get rid of the little flat piece of paper inside the roll. 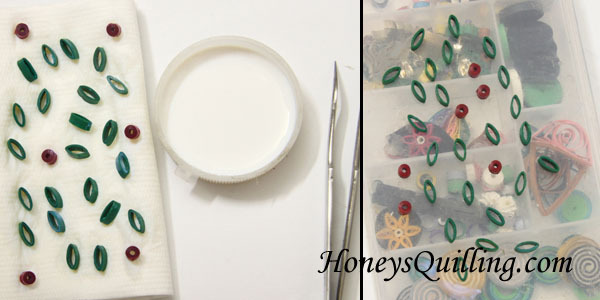 Now you need to use sealant on your pieces before assembling them into earrings. For this type of earring I always use a liquid sealer . I know diamond glaze can be mixed with some water (I’ve done it as a topcoat mixed with water and it works well) so that is another option. Pour some of the liquid sealant into a cap or small dish. 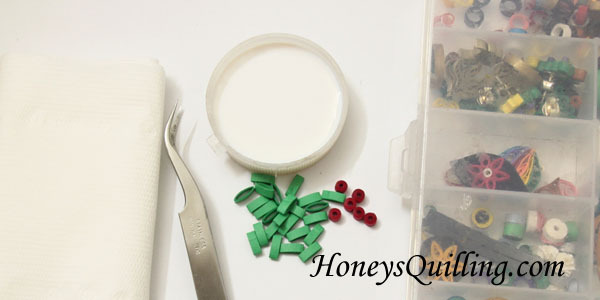 Drop the pieces in, make sure they are all covered, and then use the tweezers to take them out one by one and set on a tissue to absorb excess sealant. Using the tweezers again, move them to a plastic surface to fully dry. *NOTE* In the above photo you see that I put ALL of the green marquis pieces into the sealant at the same time. I would suggest only putting in about 5 at a time, taking them out, and repeating. When you put them all in at once the last few that you take out can be a bit softened from the sealant and therefore they can become misshapen if you bump them. *NOTE* You can see that the plastic surface I use to set my pieces on to dry is one of my little storage containers for some finished and extra quilled pieces. Any smooth plastic surface will work. Once all of your pieces are fully dry it is time to assemble! Attach 7 small jump rings to each earring hook. Set out your pieces so you can make sure that both of your earrings will be exactly the same. You can put the little red berries anywhere you want. I like to put two on one side and one on the other. I also like to leave a layer of plain leaves between each layer that has a berry so they don’t look too clumped up. Open a medium jump ring and put one of your marquis pieces on it. Hook the jump ring onto the top ring of your earring chain and close it. Put the next piece (the one across from it, not under it) onto the other side of the SAME small jump ring. On the right here you can see the first layer is finished. Both marquis are attached to the same little jump ring, just on opposite sides. Continue working, putting two pieces onto each small jump ring in the main chain. In the left photo below you see two layers done (including the first berry!) and in the right photo you see the first three layers done. It’s hard to see the rest of the chain hanging down, but it’s there. Continue adding two pieces to each layer, one on each side. The last jump ring on the bottom you will add three pieces to. You are finished! Of course you can feel free to make this earring shorter or longer. You can make this style of earring in any color. Here are a few that I have made in other colors. Some short, some long, these are so much fun! I hope you enjoyed this tutorial! As always, I’d love to hear back from you if you try it out, and please comment with a link to your work so I can see it, or send me a message! 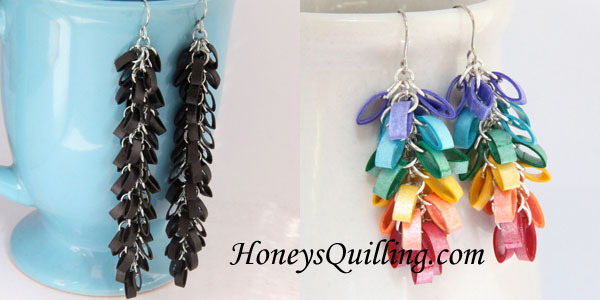 NextCan You Use Clear Nail Polish to Waterproof Paper Quilled Jewelry? Really useful n ur design is unique n I like it v much. 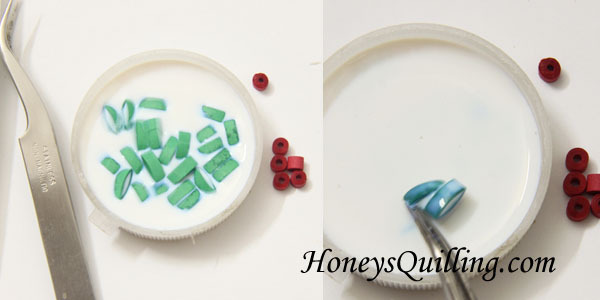 Beautiful work… I recently started learning quilling and I find ur tuturials very useful!